It may not be the Olympics, but we’ve been busy with Brazil too. Last week, Leanne Pundt visited Geremia’s Greenhouses in Wallingford to help train their interns on how to identify and monitor for insects on their yellow sticky cards. The interns are all from Brazil and part of The Ohio Program, an International Exchange Program of The Ohio State University specializing in Internships for Horticulture, Agriculture and Turf Grass. 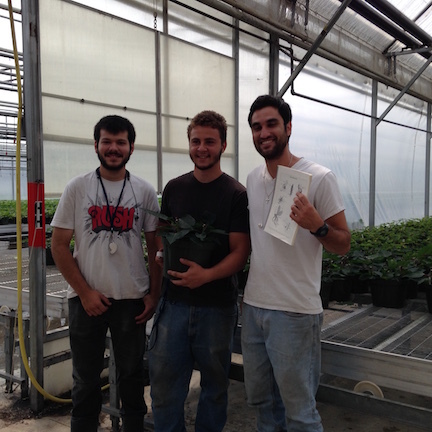 Interns were: Giovane Giorgetti, Thales Fogagnoli, and Paulo Boaretto (holding the reference book). According to a 2012 survey of employers conducted by the Chronicle of Higher Education and American Public Media’s Marketplace, an internship is the single most important credential for recent college graduates in their job search. The UConn Extension/4-H Internship Program was created to offer paid career-oriented summer internships to undergraduate students. Students take what they learn in the classroom and apply it in the field, while assisting extension educators with program delivery. “We’ve focused on underclassmen as it is very difficult for them to secure summer internships in these specialized career fields,” says Paul Gagnon, the College’s career consultant with UConn Center for Career Development. Students apply for the competitive internships, and if selected, they complete a learning agreement that includes an outline of the summer project objectives and expected outcomes. In addition, each student receives mid-summer and end-of-summer evaluations and must take a non-credit notation course that requires a summary paper. While students do not receive academic credit for the course, upon completion the internship is noted on their official transcript. Erinn Hines with two 4-H members. The internships are funded through donations to the UConn Extension held by the UConn Foundation. For summer 2016, ninety students applied for twenty-six possible slots in a variety of extension programs throughout the state. After evaluation of applicants’ skills, interests and geographical issues, fourteen internships were awarded. 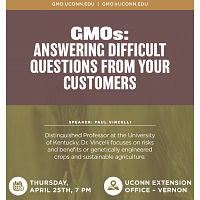 Collaborating with Gagnon to facilitate the program are Michael O’Neill, associate dean and associate director for UConn Extension; Bonnie Burr, department head and assistant director of UConn Extension; and Marilyn Gould, administrative assistant. Nonpoint Education for Municipal Officials (NEMO) MS4 Stormwater Management Internship (Middlesex County Extension Center). 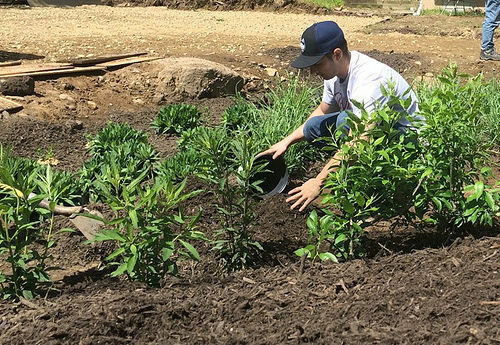 William Teas, natural resources and the Environment major, is working with UConn’s Center for Land Use Education and Research (CLEAR) NEMO program team to develop resources for communities facing new stormwater management (“MS4”) regulations. The Connecticut Department of Energy and Environmental Protection (CT DEEP) has developed robust new regulations for Connecticut communities and institutions who manage a separate stormwater system, and CLEAR is developing workshops, websites and other materials to support communities in meeting those requirements. Center for Land Use Education and Research and CT ECO Geospatial Internship (Middlesex County Extension Center). Luke Gersz, Natural Resources and the Environment major, is working with the UConn CLEAR geospatial team to advance the map catalog part of the CT ECO website. CT ECO is a partnership between UConn CLEAR and CT DEEP to make Connecticut’s natural resource geospatial information available. Community Nutrition Programming Intern (Fairfield County Extension Center). Julia Cobuzzi, allied health sciences major, is working in community nutrition programming in Fairfield County and will have the opportunity to work with two federal nutrition programs, the Expanded Food and Nutrition Education Program (EFNEP) and SNAP-Ed (Supplemental Nutrition Assistance Program Education). Emergency Preparedness Intern (UConn, Avery Point). Thomas Martella, cognitive science major in the College of Liberal Arts and Sciences, is working with a diverse group from UConn Extension and with town officials, and will gain experience in creating/editing videos, developing script and posting information on a website. This effort is required as Connecticut’s coastal communities face increasing risks due to storm and flood events, yet attitudes and actions toward emergency preparedness and evacuations are often lackadaisical. Sustainable Food Systems Research Intern – Buy Local Initiatives and Marketing Approaches (Tolland County Extension Center). Anne Page, finance major in UConn’s School of Business, is conducting a literature review on public education strategies that promote buy local behavior in direct and institutional markets, forming a foundational piece of research for future iterations of UConn Extension’s CT 10% Campaign and the Live Local projects. The office is a shared work space, where there is exciting interaction with team members that work on FoodCorps, CT Food Justice VISTA Project and the CT 10% Campaign. Invasive Plant internship (Storrs). Kelsey Brennan, individualized major in sustainable agriculture in the College, is assisting with the development, coordination and implementation of numerous invasive plant management activities in Connecticut, including prevention, early detection, rapid response, monitoring, control (including biological control of the invasive plants mile-a-minute weed and purple loosestrife) and disposal. 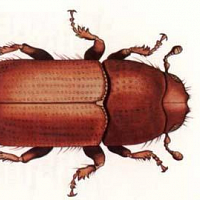 The intern will primarily work with members of the Connecticut Invasive Plant Working Group (CIPWG) but will also gain experience in interacting with scientists and other educators in the field to learn about non-native invasives. 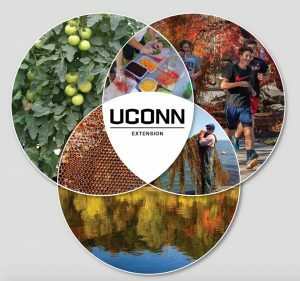 Each year, UConn students apply and compete for paid internship opportunities with UConn Extension, whose mission is to connect the power of UConn research to local issues by creating practical, science-based answers to complex problems. This summer, 13 students are tying research to real life in our UConn Extension offices across the state. John McDonald, a psychology major in his junior year at UConn, works with Laura Brown, Extension Community and Economic Development Educator in the Bethel office. This summer, John is helping with several emerging research pieces around the Community First Impressions program and the emerging development of a state multi-user trails study. As a graduate student in agriculture and resource economics, Nadege Kenfack already has experience researching a variety of issues. Nadege is working with Extension educator Jiff Martin in Vernon to further develop strategies to increase local food consumption, with a particular interest in Community Supported Agriculture (CSAs) and buy local campaigns. Joanna Slemp is a junior majoring in resource economics, and is developing online learning modules for the ornamental and turf programs at the West Hartford office. Joanna and mentor Candace Bartholomew are building the design and arrangement of content, graphic interfaces and other necessary technical pieces of the Online Learning Modules. Kerrin Kinnear in our Haddam office. Dave Dickson photo. The UConn Extension Center for Land Use Education and Research (CLEAR) is based in Haddam and provides information, education and assistance to land use decision makers, in support of balancing growth and natural resource protection. Kerrin Kinnear, a junior in majoring in environmental studies, is working with Dave Dickson this summer on low impact storm water regulations. Kerrin is working with town staff on the adoption and implementation of low impact storm water regulations. She is interviewing key town staff in other towns that have begun to adopt LID-friendly storm water regulations to get a sense of the drivers behind the regulations, factors affecting LID implementation and the impact of the regulations. 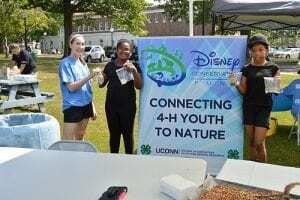 The UConn Extension 4-H youth program prepares youth to meet the needs of a global economy, while learning new skills, meeting new friends, and discovering new things about themselves and the world through UConn’s research-driven programs. In 2014, 20,180 youth participated in UConn Extension 4-H programs. By teaching young people that science can be fun, we build on a century of knowledge that early STEM exposure opens doors for youth to explore and directs them to think of careers in these fields. UConn 4-H is preparing the next generation of scientists, engineers and technology experts; and six of our interns are working with 4-H programs this summer. In our Torrington office, Yoon-Young Choi, a graduate student in agricultural and resource economics, is building off of her studies to serve as the 4-H Youth Development Program Research, Assessment and Evaluation intern. Under the direction of Laura Marek, Yoon is researching current 4-H youth development program evaluation models, collecting data to be used for evaluating several aspects of the UConn 4-H Program, and working in conjunction with state 4-H staff in writing up results of the evaluation. 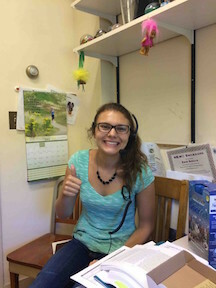 Joanna Murawski, a graduate student in health promotion, is also working in the Norwich office this summer with Pamela Gray and 4-H education. Joanna is providing outreach through the delivery of 4-H programs, assisting in the preparation and duties of the New London County 4-H Fair, assisting in 4-H promotion through social media, and managing administrative duties as required by the 4-H program. In West Hartford, Rebecca Masse, a junior majoring in agriculture and natural resources is serving as the Hartford County 4-H program assistant and working on a variety of unique and innovative initiatives under the guidance of Laura Marek. As a senior majoring in Animal Science, the 4-H Equine and County Fair Program internship with Emily Alger in Haddam is a natural fit for Delaney Patterson. Delaney is working with the State 4-H Horse Program and the Middlesex & New Haven County 4-H Fair Program. A second intern will also be influencing the outcome of the Middlesex & New Haven County 4-H Fair. Erinn Hines is a UConn sophomore majoring in Human Development and Family Studies and is working with Margaret Grillo, in the North Haven office. Erinn is also helping to launch the Discover Science through 4-H Program, and improving the office’s social media footprint. As a mechanical engineering major, Howard Ho, a freshman, brings a vital skill set to his internship with Dr. German Cutz in Bethel. Howard’s work focuses on developing lesson plans for and teaching the 4-H Robotics and Technology Program to groups of Lego robotics students. Up to 60 participants are expected in this summer’s program. Holly Lewis is an allied health science major in her sophomore year at UConn. She is working in the Brooklyn office with Marc Cournoyer on 4-H Education and the Pasture and Livestock Data Program. 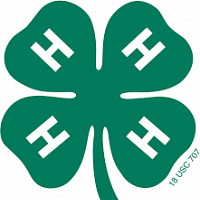 4-H youth programs in gardening, STEM mini camps, and county fair activities are included in Holly’s projects. She is also travelling to local livestock farms, sampling for pasture quality and collecting livestock yield data. For more information on UConn Extension, please visit our website at www.extension.uconn.edu. Extension internships are facilitated through the UConn Center for Career Development. If you would like guidance on how your organization can establish an internship program with UConn students please email your inquiry to internships@uconn.edu. 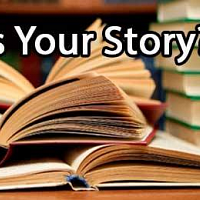 Members are encouraged to write memoirs to share in class. New members are welcome. Come learn with the Center for Learning in Retirement and Amy C. Groth, Professor Department of Biology, ECSU. 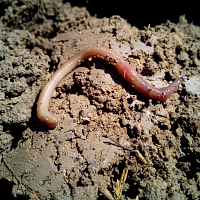 How the microscopic worm C. elegans can be used to study genes involved in human development and disease, using modern genetic and molecular techniques including the cutting-edge genetic engineering technique CRISPR .